Yesterday was the third anniversary of one of the most inaccurate and misleading articles about climate change impacts on the Arctic that has ever been published by a UK newspaper. On 31 August 2014, ‘The Mail on Sunday’ featured an article by David Rose which claimed that the rate of decline in Arctic sea ice extent had slowed. 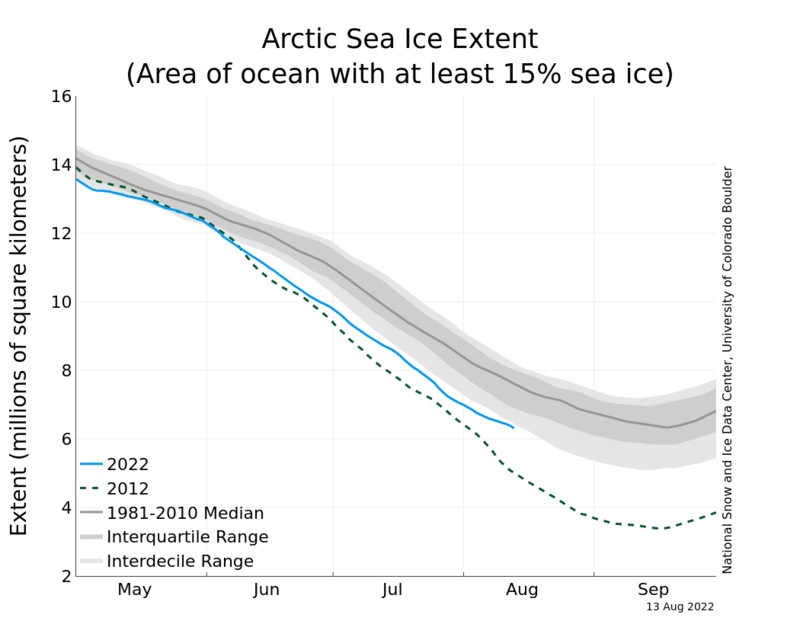 Mr Rose cherry-picked the figures for sea ice extent on 25 August 2013 and 25 August 2014 and compared them with the corresponding measurement for 25 August 2012. Although the article acknowledged that “the long-term trend still shows a decline”, it stated that “The Mail on Sunday can reveal that, far from vanishing, the Arctic ice cap has expanded for the second year in succession – with a surge, depending on how you measure it, of between 43 and 63 per cent since 2012”. What the article failed to disclose was that 2012 was a record-breaking year, with the summer sea ice extent at its lowest level since satellite measurements began in 1979. And now the latest data collected by the United States National Snow and Ice Data Center show that Arctic sea ice extent on 25 August for each of the last three years has been markedly lower than on the same date in 2014. Not only do the data expose how Mr Rose cherry-picked the figures that he cited, but they also comprehensively illustrate that there has been no significant change in the rate of decline in Arctic sea ice extent. 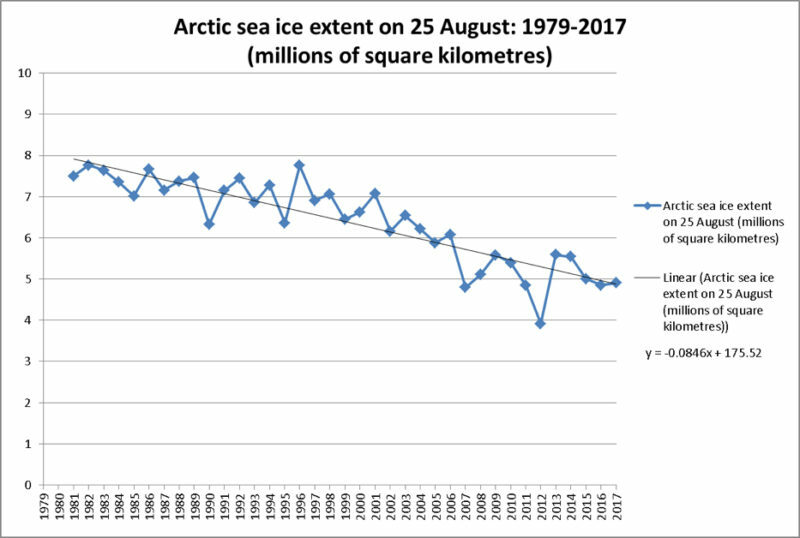 Sea ice extent on 25 August has been decreasing at an average rate of more than 80,000 square kilometres per year. While it is unlikely that this summer’s minimum extent will set a record low, the winter maximum in March was the smallest since measurements began. The sea ice has melted relatively quickly for much of the past six months, but cooler than average temperatures in the Arctic in August have slowed the rate of decrease. The Center also pointed out that the Arctic region is warming at a faster rate than the global average. Warming in the Arctic has accelerated in recent decades, particularly since 2005. The 10 warmest years since records began for the Arctic in 1900 have all occurred within the last 12 years, and 2016 was by far the hottest. The most recent ‘Arctic Report Card’, produced by the United States National Oceanic and Atmospheric Administration, concluded that the “persistent warming trend and loss of sea ice are triggering extensive Arctic changes”. In addition to the fall in sea ice extent, the report warned: “Observations of sea ice thickness and volume from multiple sources have revealed the continued decline of the Arctic sea ice pack over the last decade”. Mr Rose’s article obviously breached clause 1(i) of the Editors’ Code of Practice, which states “The Press must take care not to publish inaccurate, misleading or distorted information or images, including headlines not supported by the text”. However, the Independent Press Standards Organisation bizarrely decided not to uphold a complaint about the fake news story in ‘The Mail on Sunday’. And Mr Rose, Geordie Greig (his editor), Gerard Greaves (the then deputy editor who commissioned the article) have yet to apologise for misleading their readers.